NOTES: Need a big shelf for this one! The Boeing company produced two of the most famous aircraft of the Second World War. The first was of course the B-17 Flying Fortress. 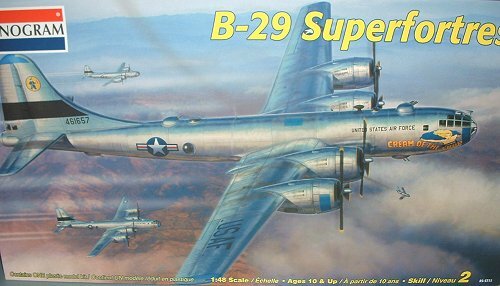 The second was the B-29 Superfortress. The B-29 was a rapid advancement in bomber technology. It had everything that was needed at the time, heavy bomb load, long range, and good defensive armament. First used in the China-Burma-India theater it flew missions over the “Hump”, and bombing missions to Japan from mainland China. The B-29 would come into its own as the island hopping campaign in the Pacific would capture strategic islands to be used as bomber bases that could reach the Japanese home islands. Islands in the Marianas were captured with the intent of using them as airfields. The 20th Air Force used the B-29 to bombard Japanese cities, often with terrifying results. Much of Japan was leveled by the big bomber. Its role as the bomber used to drop the only atomic weapons ever used in anger make it famous and infamous at the same time. If for nothing else the B-29 would deserve a place in history just for this. WWII did not end the career of the B-29. It went back into action during the Korean War, providing the backbone of the bombing force used in this conflict. It was also important in the early X-plane program, being used as a drop ship for several notable achievements. The first thing that is notable about this kit is the box. It is huge. Being a fan of the Monogram series of bombers I have always admired the big B-17 and B-24. This kit is significantly bigger. 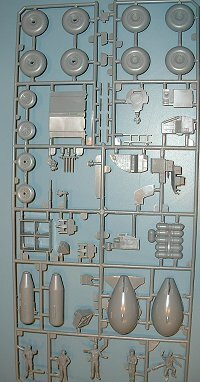 What you get in the box is eight cleanly molded sprues, seven in light gray plastic, and one clear. 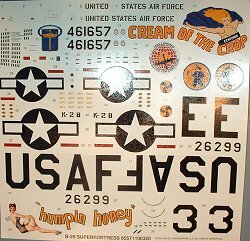 The decals provide markings for two aircraft on WWII version and one Korean War version. The decals appear to be well printed and in register. 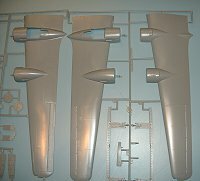 A new sprue is provided for the Hamilton Standard propellers, and the Curtiss props are also included. 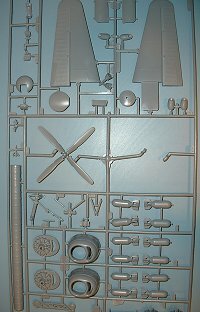 The rest of the kit is the same as previous releases including the parts for the “Fat Man”, and “Little Boy” atom bombs. 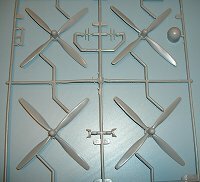 However, building one of the atomic bombers will require replacement decals. Overall this looks like a very nice kit. I have never built one but will imagine that it will be typical Monogram quality. 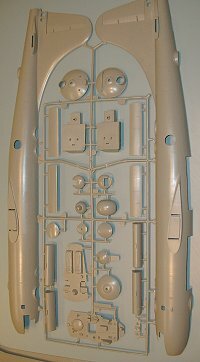 The interior parts look good, and the fine raised panel lines are well done. Careful handling and construction will be needed to minimize scratching the plastic in preparation for a natural metal finish. I will also need to stock up on Alclad since this thing is going to need a lot. In the end the paint might cost more than the kit.